This time of year is an excellent season to head to Chile for vacation and Hotel Refugia may be just the sort of place to catch up on your reading and get some fresh air. 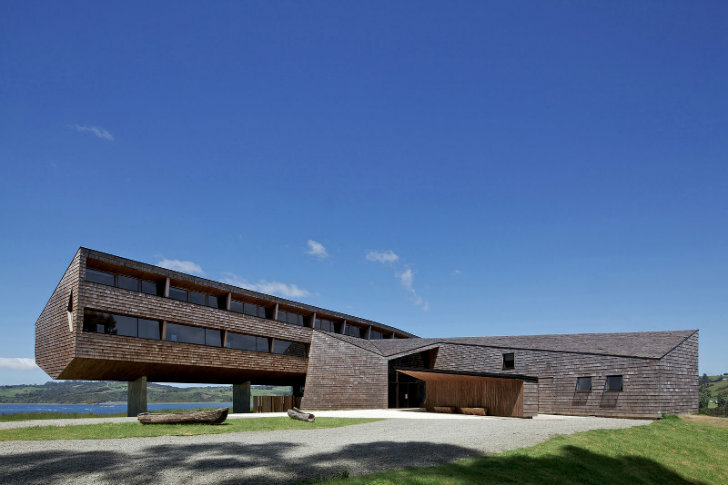 Located on the Rilan Peninsula on the Island of Chiloé in the Lakes Region of southern Chile, Hotel Refugia is a sheltered refuge on the rugged coast. Designed by Santiago-based, Mobil Arquitectos, the hotel is inserted into the landscape to minimize impact and makes use of solar passive design and a strong envelope to minimize energy use. Enjoy the stunning views from inside the cozy lounges, take guided boat trips, horseback rides, trek or just enjoy nature using the hotel as your eco home base. Mobil Arquitectos sought to plant a light footprint on the topography of the landscape with the hotel and the rooms are perched up like a bridge on top of four concrete pillars. Their design also sought to maximize light, space, sky and perspective. The weather is fickle on the Island of Chiloé and can go from sunny to windy to foggy in a matter of an hour, so the hotel was designed as a sheltered refuge in which guests can still enjoy the changes and observe nature. Extensive glass facades, natural materials like larch wood and exterior sheltered spaces encourage contact with the environment. In order to achieve the desired effect while minimizing energy use they made use of solar passive design and oriented the building and windows to make the most of the sun. North facing windows were decreased and shaded to minimize overheating, while south facing windows maximize the view. Thermal mass via concrete floors move heat throughout the building in the winter. Alternatively, natural and cross ventilation and shading help keep the interior cool. Skylights and energy efficient mechanical systems also help reduce energy use. The exterior is clad with shingles that were installed by hand, but were optimized with parametric design to create the most efficient use of materials. Hotel Refugia is open from September through the end of April with rates starting at $530. Mobil Arquitectos sought to plant a light footprint on the topography of the landscape with the hotel and the rooms are perched up like a bridge on top of four concrete pillars. Their design also sought to maximize light, space, sky and perspective. 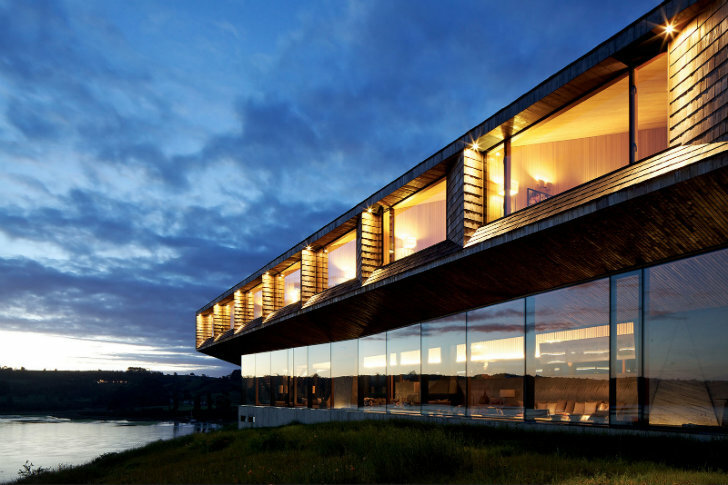 The weather is fickle on the Island of Chiloé and can go from sunny to windy to foggy in a matter of an hour, so the hotel was designed as a sheltered refuge in which guests can still enjoy the changes and observe nature. Extensive glass facades, natural materials like larch wood and exterior sheltered spaces encourage contact with the environment. In order to achieve the desired effect while minimizing energy use they made use of solar passive design and oriented the building and windows to make the most of the sun. North facing windows were decreased and shaded to minimize overheating, while south facing windows maximize the view. Thermal mass via concrete floors move heat throughout the building in the winter. Alternatively, natural and cross ventilation and shading help keep the interior cool. Skylights and energy efficient mechanical systems also help reduce energy use. The exterior is clad with shingles that were installed by hand, but were optimized with parametric design to create the most efficient use of materials. Hotel Refugia is open from September through the end of April with rates starting at $530. Cozy lounge from which to watch the landscape. Another lounge with beautiful views across the inland sea. One of the luxe bedrooms.